The Luzon 18L Daypack in Boba Fettish and Nekark stylings. There are also six other color schemes available. If you’ve been reading my posts, especially my review of my Volta Rolltop, then you know how much I respect and admire Cotopaxi. My Volta has treated me so well that when I started looking for a daypack, I wanted to check out Cotopaxi Luzon Daypack. So Clarissa and I each ordered one, figuring we could get our first use out of them during our weekend of Car-Camping at Loud Thunder. We also ordered a couple more t-shirts, because they’re insanely comfy and look cool. Our shipment arrived the Monday before our camping trip, but I was sad to see that they had shipped me the wrong color. The Luzons come in some pretty cool color schemes, and I briefly considered just keeping the one that they had sent me, but it was just a little too bright for my taste, so I opted to exchange. I suppose this could be a criticism of Cotopaxi. After all, they did send me the wrong pack. That’s just not how I feel about it though; everyone makes mistakes. Individuals do, giant companies do, small businesses do, superheroes do. It’s part of life. So while I experienced a little disappointment at receiving the wrong color of pack, I was more interested in the reaction I received when I e-mailed the company about it. Every company makes mistakes, but not every company responds to your e-mail the next morning (and they might have gotten back to me sooner, if I had contacted them before 11:00 PM). Not every company would send out a replacement the same day, before I even had the opportunity to get the return in the mail. Not every company pays for return shipping. Not every company has friendly and helpful customer service. 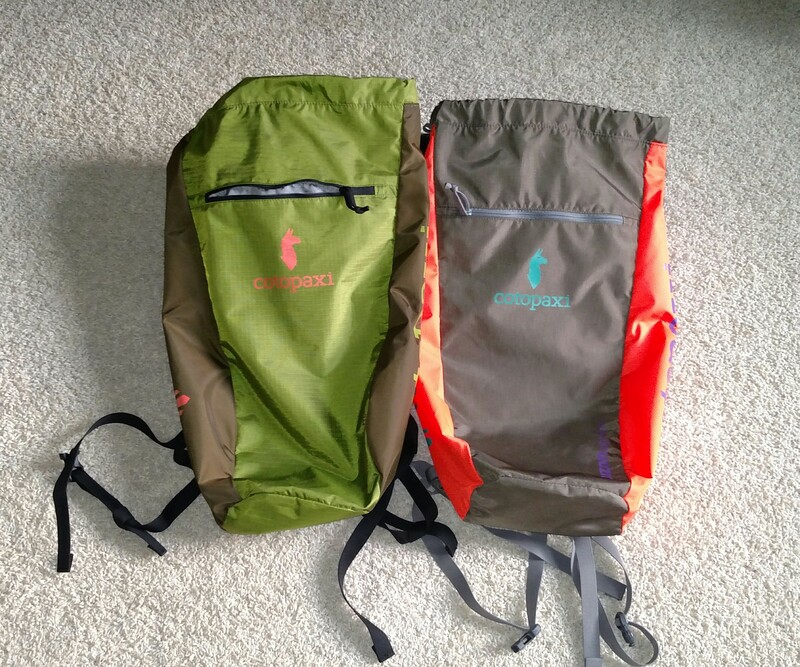 If Cotopaxi loses points for sending the wrong bag, they more than make them up by their quick response, friendly interaction, and helpfulness. Everyone I dealt with was determined to make sure that I got my pack in time for the weekend’s adventure. And I did; it was waiting for me when I got home Thursday night, along with some sweet pocket sized Cotopaxi notebooks. These are pretty handy little notebooks. Perfect for slipping in a back pocket or in a pack. But before we get into the details of how you can win this Luzon giveaway, let’s talk about the bag itself. It’s a pretty simple daypack, but simple is good in my book. It has a main compartment with a pouch for a hydration bladder (not included, but they can be found pretty inexpensively these days; Clarissa already owned two, so we were set). 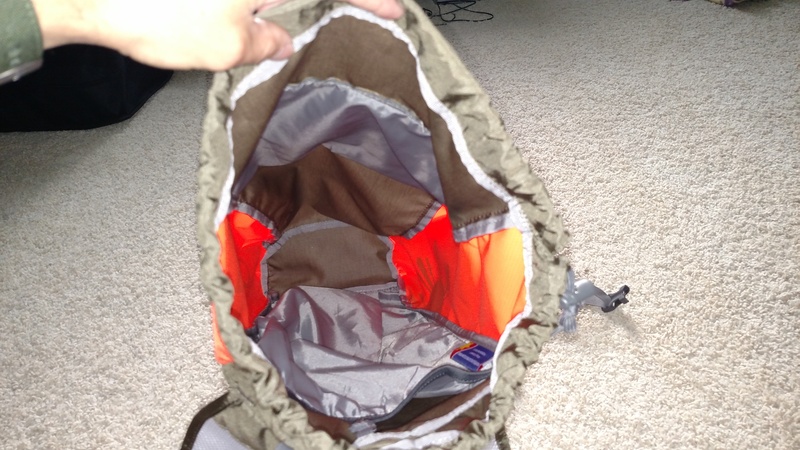 The main compartment and pouch for the hydration bladder. It’s a comfortable bag. The shoulder straps have the right amount of padding, but are still quite breathable. It has a hip belt and chest strap, so that any weight that you’re carrying is evenly distributed and carried on your waist, as opposed to hanging from your shoulders. It’s a good setup, easy to adjust, and pretty comfy. Here you can see the straps, waist strap, and chest strap. The bag closes by way of a drawstring, which I thought would make it fairly insecure. I was wrong. The drawstring locks down tight, and though I’ve only had the pack for a couple weeks now, I’ve been trying to abuse it, and it just won’t give up. It stays tight, no matter how I toss the pack around. It’s easy to see that it’s well constructed. If you’re worried about valuables falling out of the bag through the drawstring (which they won’t, but I get it, you don’t want to lose your keys, I feel you) there is an external zippered pouch. It’s not large, but has ample room for a wallet, car keys, and cellphone. Here’s the drawstring and the front zippered pouch. The pack is made out of ripstop nylon. It won’t stop bullets, but it’s durable and will stand up to a lot of abuse. The shoulder straps are solid and have a decent amount of padding, but they’re made of ultralight mesh, so they breathe really well. So let’s talk about what I’ve put this bag through. If you read my post about our Car-Camping trip to Loud Thunder, then you already know that our Luzons were on our backs for roughly eight miles. Some of that was squeezing over or under fallen trees, scampering up rocks, or going off trail through a variety of trees and brush. They never got hung up, and they sustained no noticeable damage. 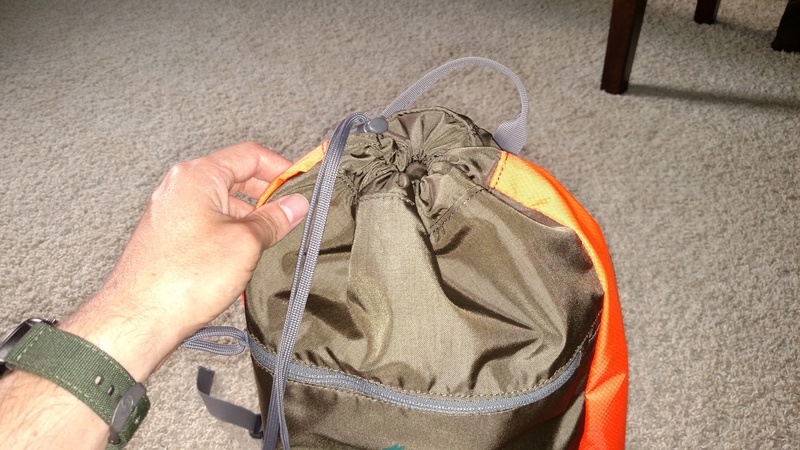 In all fairness, it was lucky that the drawstring never got caught on anything, but this would be easy to avoid by feeding it back into the main compartment after closing the opening. The two gallons of water rode comfortably for the entire hike, as did the snacks, rain gear, lights, and long sleeves we hauled just in case. A few weekends ago we decided to hike from our own neighborhood, across the river, through Davenport, back over the river via a different bridge, then up to the grocery store. We hit up Whitey’s for milkshakes on the way back, which is always the right decision. This wasn’t exactly strenuous hiking, but it was hot and the hydration pack really came in handy. We hiked about another eight miles that day, with pretty light loads. We carried some snacks, some trash bags, and some groceries on the way back. The packs remained comfy the whole time. I decided to give my pack a little more testing by using it to haul my running gear to and from work one day, as well as hauling my gym gear the next day. Both of these days I carried my athletic gear in addition to my daily work stuff and lunch in my bag. The Luzon was a little full, but it did the job. It wouldn’t be my first choice for this use, just because the extra set of shoes and lunchbox really made it feel a little overfull. That being said, it was serviceable for these uses even though that’s not really what it’s made for. The left side view. The design is pretty cool; I even got a couple compliments at the gym. How does it all work out? Strong but comfortable. The Luzon is durable, lightweight, and breathable. The waist and chest strap mean that it distributes weight as well as more technical packs, without the added bulk or weight. That’s an overall win. Both Clarissa and I thought that the Luzon was super comfortable, and is absolutely a great fit. We’re also both pretty small people with slim athletic builds. The Luzon only comes in one size, and I think that it will fit most people very well. The exception might be those of you who are very tall or very large; it may not feel quite as natural on your back, but I still wouldn’t count it out. It looks sharp. I got a Nekark and Clarissa got a Boba Fettish. There are other color schemes available as well, suitable for a number of different tastes. The size is right. 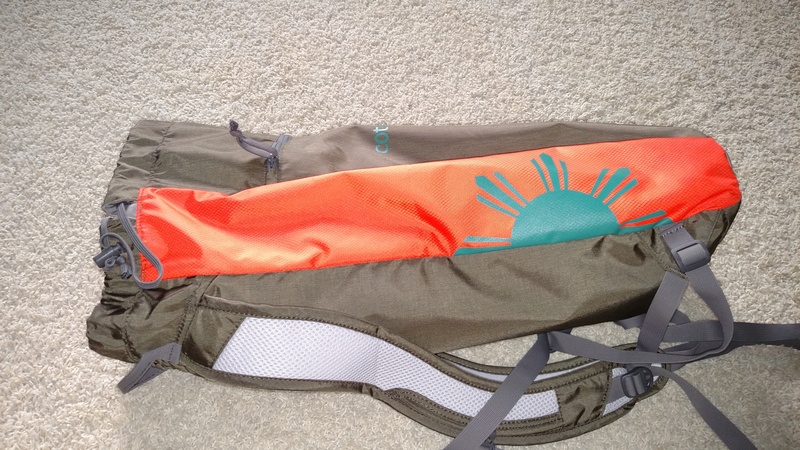 The Luzon, even with a hydration pack will easily fit in other gear. I stowed it in my Volta when we went to Loud Thunder, with negligible reduction in overall capacity. I actually forgot that I had brought it until it was time to hike. The small size also means that it doesn’t stick out too far from your back, even when full. Depending on how snug your rain gear is, the Luzon will likely fit underneath it. The low profile means you can crawl over and under stuff without getting hung up (we crawled over, under, and through fallen trees several times at Loud Thunder, without ever getting snagged). The price is right too! At $40.00 plus shipping, it’s hard to beat. Sure, the hydration bladder isn’t included, so that could set you back. But you can pick up a serviceable bladder for $10 to $20 on Amazon, so if you’re starting from scratch, roughly $50 will get you out on the trail. No internal structure. Personally, I don’t even see this as a negative, but I know some people prefer to have an organization system in their pack. That’s generally not what I’m looking for in a daypack, but if you’re looking for organizational structure in your pack, you’ll probably want to pass on the Luzon for something more technical. If you’re looking for a good daypack for hiking where you can carry some stuff with you, this will be aces. Actually, that’s it. Unless you desire a pack with various pockets, pouches, and compartments, or you’re doing activities that require a specialized pack, this bag is great. Just really really great. Conclusion:My conclusion? If you’re in the market for a daypack for hiking, biking, bouldering, or other outdoor adventures, get this pack. Get a hydration bladder on the cheap and you’ll be all set for the trail for around $50 or less, factoring in shipping. I don’t think you’ll regret it. I’m extremely happy with this bag; it’s the best daypack I’ve used, and I’m excited to have it strapped on my back while Clarissa and I hike Harney Peak in a couple of days (that’s honeymooning done right, friends). Cotopaxi keeps delivering incredible gear and excellent customer service (I actually just received a phone call from Casey at Cotopaxi just to make sure everything had gone off without a hitch in the exchange; every experience I have with them is excellent). On top of great gear and great people, Cotopaxi has perhaps the best business model for adventurers who care about fellow inhabitants of our world. Definitely consider them next time you’re shopping for a bag. Remember I said that Cotopaxi let me keep the Luzon that they sent? Well, I want to pass on the good karma, so I’ve decided to have a little giveaway! It’s pretty simple. Follow me on Instagram, post a photo of a recent adventure/microadventure, and describe in the comments how you’ll make good use of this Luzon pack! Make sure to tag me in it, and include the hashtag #IntrepidGiveaway so that I can find it. Also, keep in mind that I can only see your entries if you have a public profile, so don’t be shy. On September 30th, I’ll select a winner (though I’ll probably get Clarissa to help me), re-gram your photo, and contact you to get your address. Then I’ll send the pack your way! 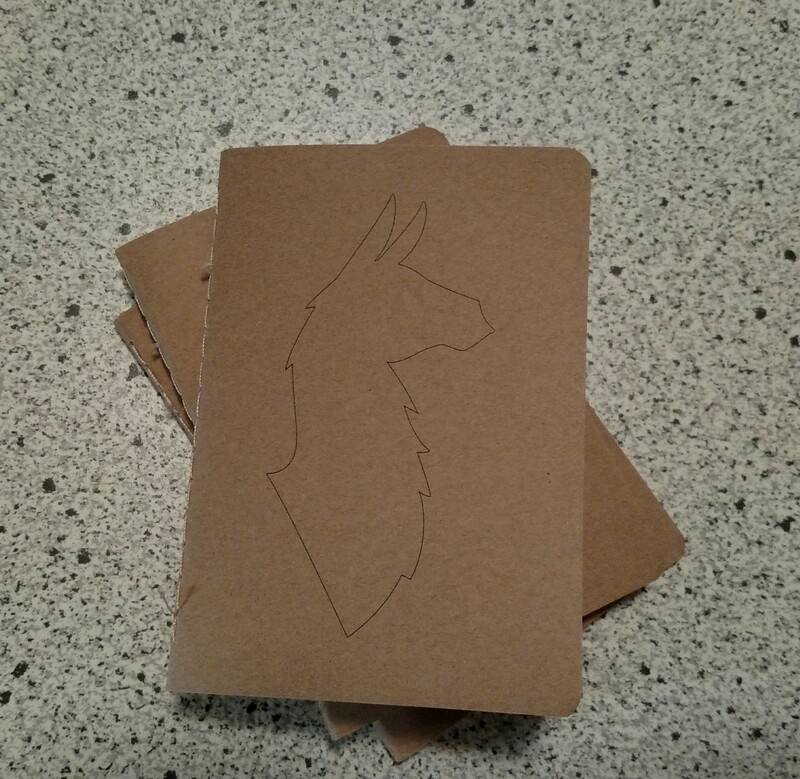 Sorry, no hydration bladder included in this giveaway, but I will add one of the sweet Cotopaxi notebooks they sent me! I’m looking forward to reviewing your entries! Until then, stay intrepid! 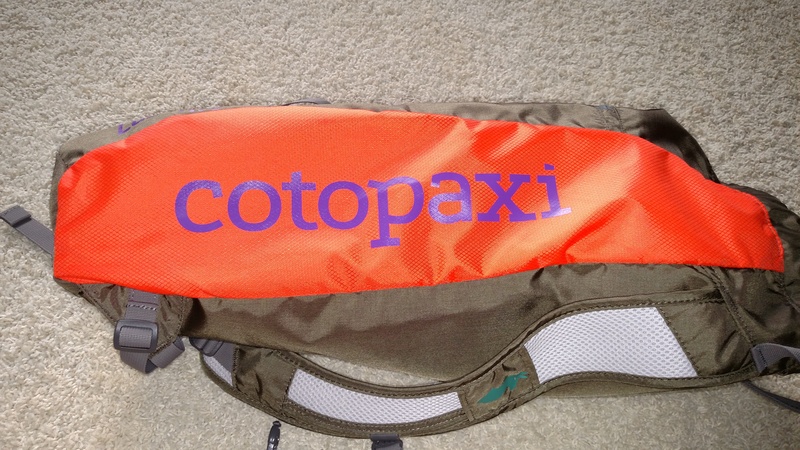 You can check out Cotopaxi here! You can check out the Luzon here!